First Lady Serita Jakes is a celebrated author and performing arts principal in her own right as well as being the Director of The Potter’s House WoMan to Woman Program and visionary of the Gold’s Leading Ladies Life Enrichment Program. Mrs. Jakes birthed the program in 2003 and has since overseen its growth into a widely recognized series that is respected for its transforming success by ministries and organizations across the globe. 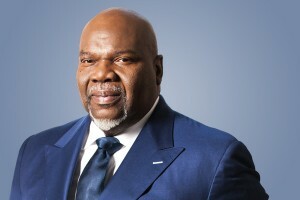 Bishop T. D. Jakes is a charismatic leader, visionary, provocative thinker, and entrepreneur who serves as senior pastor of The Potter’s House, a global humanitarian organization and 30,000-member church located in Dallas. Named “America’s Best Preacher” by Time Magazine, Jakes’ voice reverberates from the world’s most prominent stages. Through a nexus of charitable works, T.D. Jakes extends a hand of help to the needy, heart of compassion to the hurting, and message of empowerment to the oppressed and disenfranchised. Beyond the pulpit, Jakes ranks among the 25 Most Influential African Americans, Britain’s 100 Most Influential Black People and EBONY’s Power150. His worldwide impact can be felt through a media empire that spans film, television, radio, best-selling books, greeting cards and conference series. His latest film, “Jumping the Broom” broke opening weekend box office records, ranking as the #1 comedy and #3 in overall revenues.